Bacchus is a gravitationally bound system composed of three planets in orbit around its two governing stars. The system falls under the sovereignty of the Banu Protectorate, and is believed by many UEE officials to host the Banu's homeworld, though, to date, the Banu themselves have not been able to or have chosen not to confirm one way or another. Like with most Banu systems, the trade lanes are always packed with travelers from Banu, Human and Xi’an space. 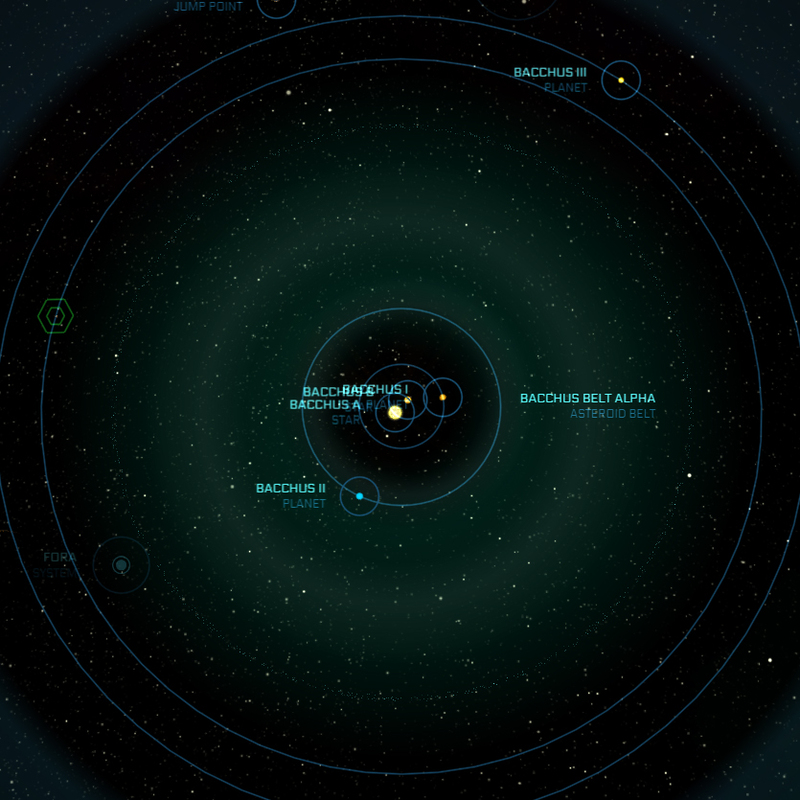 A large permanent flotilla in the system's outer reaches is a popular destination for haulers and traders. A class-G main sequence star resembling Sol, with an average temperature of 6,000 K.
A class-K main sequence star with an average temperature of 4,000 K.
An ocean planet dotted by thousands of populated islands and archipelagos featuring a wide variety of climates and biodiversity. Though the Banu have so far not confirmed if Bacchus II is their home-world like some in the UEE theorize, it is known that the planet hosts the 'Gathering': a special event where Banu congregate to make species-wide decisions. A gas giant featuring dynamic swirling clouds and frequent electrical storms. Belt Alpha is located between the planets Bacchus II and Bacchus III. A large cluster of ships that has become a permanent floating marketplace. Conveniently located near a jump point, it attracts a wide variety of travelers and traders entering and leaving the system. The Flotilla is located between Bacchus II and Bacchus III.